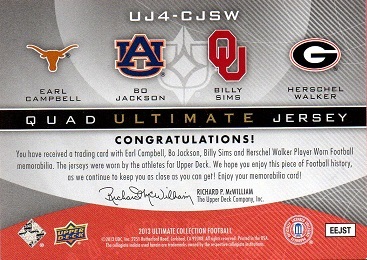 Picked up a nice Upper Deck Ultimate Quad Jersey card of Herschel, with 3 other star running backs. There is a jersey swatch from each player. 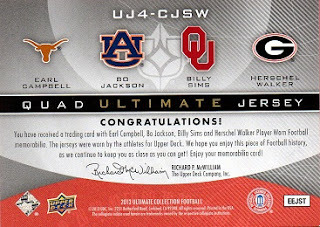 In this particular case, Walker shares the card with Earl Campbell, Bo Jackson and Billy Sims. 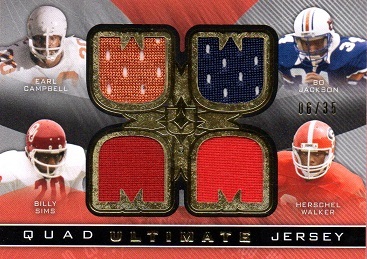 This is a 10 card set; and Herschel Walker is actually in the set on three different cards. Besides this example, he is on a card with Barry Sanders, Bo and Earl; and also with Barry, Billy and Bo.